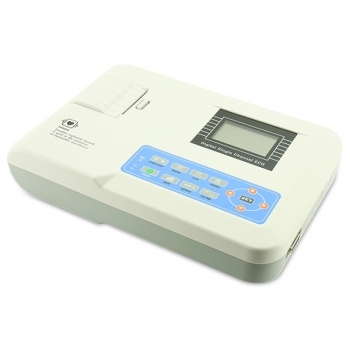 YSECG100GV single channel electrocardiograph can print ECG waveform with thermal printing system, prompt for “Lead off” and “Lack of paper”, display multi-language interface, record ECG waveform with manual or auto-mode, which is very convenient for operation. Digital signal processor, gets better quality ECG waveform by ECG signals filtering through the power frequency filter, baseline filter and EMG filter. Output system: High-resolution thermal-array (8dots/mm), without any adjustment. Recording frequency Response: Up to 150Hz. The device can record exact single channel ECG waveform and annotation in real-time and continuously. The annotation includes: lead sign, sensitivity, paper speed, filter state, etc. Under automatic mode, just press the button once, the device will complete record automatically, which improves work efficiency. The languages of operation interface include Chinese, English, French, Italian, German, Spanish and Turkish. Print languages include Chinese, English, French, Italian, German, Spanish and Turkish. In optimal DC state, the device can standby 7 hours, print 4 hours continually and record 150 pieces of ECG waveform.